Directions: From the intersection of Hwys. 85 and 90 turn east on 90 and go approx. 7 miles to Mt. Olive Rd. on your left. Turn and go to entrance of Mt. Olive Estates (not too far down the road on your left). Remarks: Real Estate Owned REO. All brick home on a 1.04 acre totally level lot. The backyard is huge and completely enclosed with a privacy fence featuring double gate on one side to drive through and single gate on the other side and one to the rear of the property. Incidentally, to the rear of the lot behind the fence is an easement that will add to your privacy as no one can build right up on you! The great room is spacious and features cathedral ceilings and a gorgeous corner wood burning fireplace as a focal point. The kitchen with lovely cabinetry, dishwasher. Bay windowed breakfast room for dining and also a convenient breakfast bar. The master suite is spacious and the master bath is oversized. This property may qualify for Seller Financing (Vendee). Directions: From Eglin Pkwy in Shalimar Take 12TH Ave and follow straight thru the 1ST Stop sign. At the 2ND Stop sign turn left onto country club,then turn right on lake Lorraine circle. Remarks: Real Estate Owned REO. This 4 bed 2 and a half bath home is located on a large over a third of an acre corner lot in the middle of Shalimar Pointe golf course, around the corner from Lake Lorraine part of Lake Lorraine Estates. You will enjoy the gunite pool, and relax on the 22×12 covered back patio. The home interior features include a formal living room, formal dining room, nice kitchen with island and stainless steel appliances. There is a lovely great room with a wood burning fireplace that has a screened/glass closure with air vents. Upstairs is the very spacious master bedroom and the large walk-in master closet call to take a look at this home today. Remarks: Real Estate Owned REO. Intricate mosaic tilework makes a stunning first impression in this lovely upgraded home in the Sandy Ridge subdivision. Note the dark hardwood floors and crown molding that run throughout the home: living room, dining room, and all three bedrooms. All wet areas feature oversized sandstone tile. The stylish kitchen is very user-friendly and boasts a mosaic-tile backsplash, granite countertops, upgraded smooth-top range and dishwasher, undermount stainless-steel sink, and a center island. Each of the three bedrooms features handy built-in shelving for easy and organized storage. The first-floor master suite is very spacious and elegant. The garden tub and shower surrounds in the master bath call to take a look today at 508 Boulder St. Directions: Coming from Hwy 90 Turn North on to Hwy 87 (Stewart St.) / then go past Milton High and start looking for Magnolia St. about half mile up on the Right. Turn Right on Magnolia St. / Rustic Ridge will be on your left. Remarks: REO. This house is complete and ready for quick move in. The Bonaventure: Absolutely beautiful all brick, 3 bedroom home. 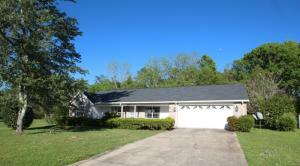 This home is an open split floor plan / 9 foot ceilings throughout the home / has finished garage. Separate shower in master bath with shower door, recessed can lights in kitchen and a large cover porch. Large oak trees left throughout the community to keep the natural beauty of the land. Directions: From Hwy 85 and 90 go north on 85 to left on Phil Tyner left on Dogwood Ln, right then an immediate left on Twin Oak, home is straight ahead at curve. Directions: From the intersection of Beal Parkway and Racetrack, turn onto Hurlburt Field Road. Emerald Lane is close to the end on the right. Townhomes are to the right off Emerald Lane. Remarks: Reo great location equally between Eglin AFB and Hurlburt Field. Close to shopping at Lowe’s, Walmart, Sam’s, Winn Dixie, etc. just around the corner. 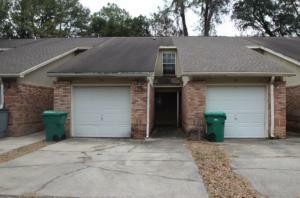 This two bedroom, one and one half townhome comes complete with a one car garage. Look at the size of the bedrooms. The master a king-sized bed will fit perfectly also, features a good size walk in closet. The laundry room is a good size and is downstairs. A small patio is out back. Small yard perfect for those who want weekend free of lawn maintenance. Directions: South of Crestview on Hwy. 85, turn West on PJ Adams, turn right on Eagle Drive, turn right on Orlimar, turn right on Titanium, house on left. Remarks: REO seller will look at both investor or owner occupant offers. This home will not be on the market long at this price. All brick home located on a culdesac in close proximity to Foxwood Golf and Country Club. The kitchen, dining, foyer & bath flooring have been upgraded to tile flooring installed with a diagonal pattern. You will enjoy winter evenings relaxing by the fireplace in the spacious living room with vaulted ceiling & plant ledge. The living room, dining room and kitchen offer an open floor plan which is great for entertaining. The split bedroom design lends privacy for the master bedroom. The large master bedroom has ample space to accommodate large sized furniture. The master bath featurs a large oversized shower and walk in closet. The backyard is privacy fenced. Call today. Directions: HIGHWAY 85-EAST ON STILLWELL TO POINSETTA TURN LEFT GO TO 2ND STREET LOOK ACROSS ROAD TO THE RIGHT. Remarks: Real Estate Owned REO Manufactured home centrally located. Front porch/back deck. Shed, ideal for investment or starter home with some sweat equity, nice sized lot approximately .35 of an acre. You need to take a look soon. It may not be on the market long. Directions: Going west on Hwy 98 past Hurlburt AFB main gate. Turn right onto Rush Park West Subdivision (located past Sunrise Marine and Tom Thumb gas station). Turn right. Remarks: REO What an incredible floorplan! Need that extra room and still be affordable? 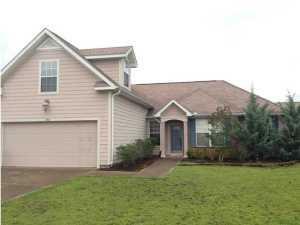 This 4 bdrm home features 2 Master bedrooms and 3 full baths! One Master bedroom downstairs and the second is the only room upstairs for total privacy! Gas fireplace graces the living room with palladium windows and a large eat in kitchen with large built-in microwave area, lots of cabinets, pantry, refrigerator with a view to the back yard through sliding glass doors. This one is a must see if you are looking space and convenience. Location? Only 1 mile from Hurlburt; 20 minutes to Eglin AFB. Close to schools and shopping. Beautiful neighborhood and great neighbors are always a plus when searching for that new home.